We are trapped. A friend of mine, very bright, knows engines backwards and forwards has gone to the fracking fields in North Dakota to work. He is around 30, has a family and was working a seasonal job. Now he is raking in the money. He told me one day they didn’t have anything for him, he sat in his truck all day and earned a lot of money. He needs a job. The way we live, we need fossil fuel energy. If we are polluting the water, polluting the air, upsetting the seismic situation , so be it. He needs a job and the way we live, we need fossil fuel energy. If he doesn’t do this work, there will be a flood of job loss repercussions locally and across the nation. 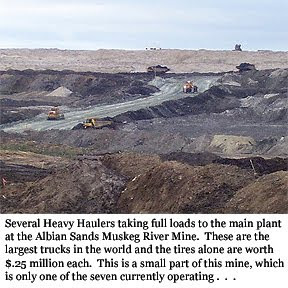 money is taking place at the tar sands in Alberta, Canada. Ludwig: Where else are oil sands located besides Canada? Beaumont: There are some oil sands in the United States as well. In Utah there are some oil sands, and in West Texas. But it's harder to produce in the U.S., because it's still environmentally very difficult. did that in the U.S. you would be in jail. Ludwig: Is that going to be an issue over the long term? lives in that area. So, they can do it. We do live there, it is the earth. A friend of my works at one of the big ski resorts in Colorado. Every year, but I guess especially this year, they are making snow. We do the same here in Minnesota. If they didn’t make snow, which to me is the height of arrogance and waste of energy and misuse of water, the job losses would be huge. Not just at the ski resort, but job losses would resound throughout the community and down the mountain. 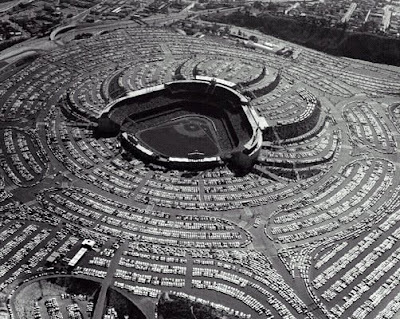 In my essay on saving energy (http://sunweber.blogspot.com/2011/11/saving-energy.html), I show pictures of a football stadium filled with people and a parking lot filled with cars. 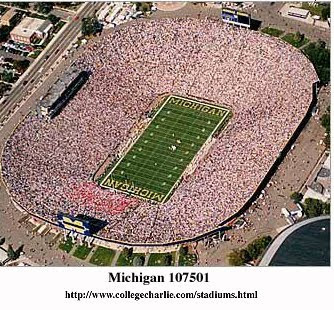 This is a tremendous use of energy during the football season and all other spectator sports – soccer, basketball, baseball, etc. – throughout the world, throughout the year. The loss of jobs here would affect whole towns, whole states, whole countries. As the U.S. of A. empire winds down, our military men and women will be coming home. Many of these men and women have been trained in high tech, energy intensive fields and in war. Where will these thousands of people work? What kind of job? Manufacturers, assemblers, installers, maintenance people and bureaucrats inspecting and providing grants for solar and wind devices, as I have written in multiple places, are extensions of the fossil fuel world will be idle when fossil fuels are scarcely available. A dear friend is an interior designer. Enough said. These careers/jobs have been valuable and contributing in the world of cheap, easily accessible fossil fuels and with the ongoing paradigm of continual growth. The men and women have been hard working people enmeshed in the ongoing vision of the their world. They are not to be denigrated for this past; their jobs are simply extraneous and not supportable in the coming world. We are trapped in needing to squeeze out every molecule of fossil fuel energy we can. It is threatening air, ground water, rivers, oceans, seismic activity, soil, and human health, but we have no choice. The strategy discussed in last week’s post—that of walking away from energy-intensive lifestyles before the waning of the age of abundant energy brings them grinding to a halt—is a viable response to the crisis of our age, but it’s also a great way to poke a stick at some of the most deeply entrenched of the modern world’s dysfunctional habits of thinking. Suggest it in public, for example, and you’ll very quickly learn why all that talk about saving the planet has turned out to be empty air: everyone’s quite willing to watch someone else make sacrifices for the good of the biosphere, but ask them to make sacrifices themselves and you’ll see just how far their love of the planet extends. “There is within every human the perpetual pull of opposites. Fear taunts courage; willpower struggles with appetite; order with disorder. Caution tugs at curiosity as impulse teases aversion. For all the stimulation of the new, there remains the powerful comfort and security of the known. We are, like Dr. Dolittle’s famous Pushme-Pullyou, conflicted creatures. Individuality is defined by these differences, by where the balance is struck. But one impulse in particular seems to have weak competition or none at all. The appeal of ease, or the less-taxing option, is unquestioned. Only the obstinate, the perverse, the eccentric, or the mad, the conventional wisdom toes, intentionally choose the more difficult over the easier method of reaching a goal. The hatchet or the ax over the chain saw? “I like the feel of the ax in my hand, the resistance, the thud of impact. I like to feel I am linked to what I am doing. I like the quiet in the forest, the smell of rosin, even the living shudder of the tree as the x bites, “ says the old woodsman. The logger smiles, pulls the starter on his chain saw, and has seven trees down in the time the woodsman spends on one. And the logger’s boss brings in the feller-buncher, the giant machine that grasps each tree in a steel embrace, then cuts it and stacks it with its downed companions as if it were kindling; and logger smiles no more as the new machine does the work of seven chain-saw-bearing men and he finds himself reading want ads. Seldom, however, is the original impulse to make things easier questioned. The religious have always known that ease is a dangerous road to travel. One reason for caution is that it’s sometimes hard to tell who the real beneficiary is. Or whether something is really as easy as it first seems. Or whether ease costs more than it appears to. Or whether something is being lost in the transition that hasn’t been mentioned, or foreseen, or accounted for. Machines, in the time of Carlyle, Dickens, and Ruskin, were making production easier. The matter of “at what cost” had just begun to be considered, and then only by a very few. Close on the heels of ease is cheap, and the combination, especially in goods, is virtually irresistible. Low cost and convenience: the machine made it possible. Pg. 79-80 Fox, Nicols. 2002. Against the Machine. Island Press. London. We are presently developing an orchard/garden that will be workable without electricity or fossil fuels if need be. We have a large below grade root cellar. This spring we are building a greenhouse that will function for at least ten months if not year round (we will have to see). We fenced our orchard and fields with good, high material that should last decades. At our age, we will need some young muscle for help, which I believe will be an easy find. Who will make the shoes, weave the cloth, spin the yarn, work the forge, grow the food?